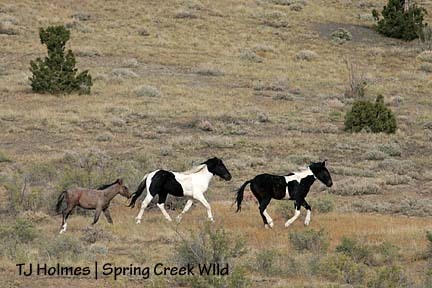 This is just a quick post to say I’ve added some additional links to the “blogroll” that may be of interest to wild horse folks. 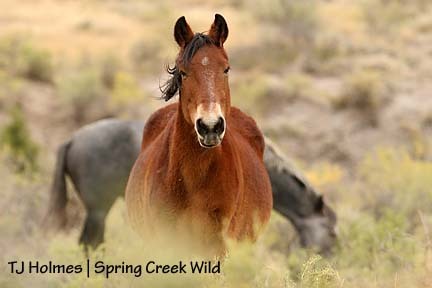 I don’t want to list every possible site known to mankind, just a few of the ones I’ve found helpful or that have led me to additional information about wild horses. 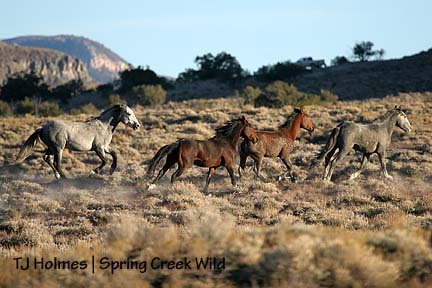 The American Wild Horse Preservation Campaign Web site, in particular, has some good information. Check the “links” link on any of the sites for even more information. My first trip of the new year to the basin wasn’t exactly what I envisioned. As much snow as I have at my house, within spitting distance of the La Plata Mountains, and as much snow as was in the basin in December, AND as much snow as we’ve had since then, I expected a lot more snow and, well, a lot less mud. It has been warm here the past couple of days (almost 50 degrees yesterday; 42 in the basin today), but it must have been warmer there longer – the snow is just in patches, and the mud is pretty nasty. There were no new tire tracks coming out of the road to the herd area off the county road, so I parked there and hiked in. I’ve been so anxious about the horses, envisioning them having to paw down through a foot or more of snow, that getting so close and yet, so far away, wouldn’t cut it! It’s about three miles from the county road to the herd area boundary; it took me about an hour and 15 minutes one way, hiking through slushy snow and seriously bad mud. The whole area is just saturated. Yucky, yucky, yucky … but I bet it’s gonna be a good spring for the ponies! There were some bulls (bovine) about halfway in, close to the road, which goes through private property before it crosses the herd area boundary. They weren’t too worried about me. Close to the boundary, I saw a big herd of elk. 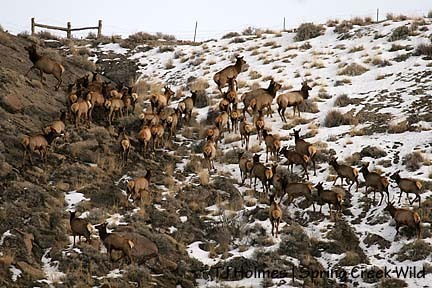 That’s a lot of elk! On the other side of the fence is the herd area. Once in the herd area, I didn’t have to go too far in to get a vantage point of a huge chunk of the basin. I sat on a rock, ate an apple and got out the binoculars. I saw lots of cows – I counted 45 in several different groups – but it took awhile of slow glassing with the binoculars to find any horses. The good news is that the first group of horses I saw were the Bachelor 7 – including my boy Grey. The ironic part of seeing him for the first time since early November was how far away he was. I also saw two dark horses even farther away. They were in some trees, so I’m not sure whether there were more than the two I saw. I did take some photos, even though all the horses were so far away I couldn’t see any of them without the binoculars. The photos confirmed that the first group was, indeed, the Bachelor 7, with Grey, and my best guess from the photos of the farther horses is that it was the bachelor stallions Ty, black with a “railroad tie” star and strip, and Mesa, solid bay. Can you see them? This is a full-frame shot, taken at 400 mm. Look above the words “Spring Creek,” just above the cut that runs the width of the photo. See those dots? Those are the boys. This is a serious crop of the previous photo. 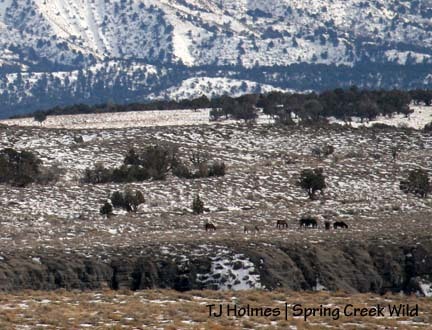 From the distance, the only horses I can absolutely identify are Aspen, far left, Grey, to the right of Aspen, and Duke, the dark horse at far right (in another photo, his head is up, and I can see his big star). Grey kinda blends into the background, but you can see his dark mane. So now I know what conditions are like. The county road is good to the Suckla Ranch turnoff, but past that, it gets dicey. My first plan was to get down to the corral from which the horse folks ride in. But the road got pretty soft, and getting stuck isn’t my idea of fun. Don’t even think about driving off the county road on the road to the herd area! It will be a long time before I get all the mud off my boots. 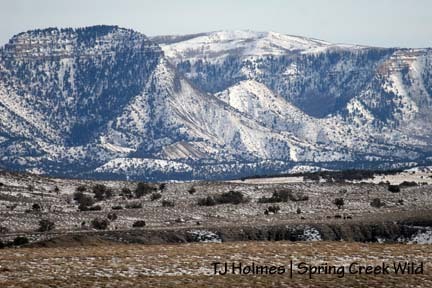 I hope all this snow and moisture means a good spring and summer for vegetation in the basin – and for the horses! I am still waiting anxiously to get out to the herd area (lots and lots of snow in this region), although I finally remembered the cattle that are in the herd area – or were in December. I realized someone must be trucking hay to them – unless they managed to get in, round them up and haul them out – so the road may be passable at least to the entrance of the herd area. I may give it a try this weekend. 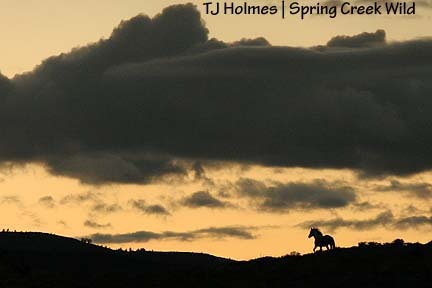 Also, I was recently asked to speak to the Mesa Verde Back Country Horsemen group at their March meeting (which will be held the week after I get back from Tucson) about my documentation project in the basin, as well as the other herds I’ve visited and roundup alternatives. Me, get to talk about my favorite subject?! I have been told there are time limits …! What I am most looking forward to is talking with people who have stories of their own to share about the horses. Relatively speaking, I’m a newcomer to this herd. I strongly believe that collaboration is one key to protection of our wild horse herds, and I’m eager to learn other people’s ideas. My friend Claude Steelman, a professional wildlife photographer based in Durango, spent time last year visiting and photographing horses in all four of Colorado’s herd management areas (Little Book Cliffs is, of course, a wild horse range). He has a book coming out later this year with a collection of those photos. Visit his Web site at www.wildshots.com for more samples of his work (awesome!). In his new “Wild Horse Gallery,” the black and white photo of the grey horse trotting away from the photographer/viewer is Grey (Traveler)! Isn’t it stunning? What’s more amazing is that it is one of just a couple of photos Claude was able to fire off after the trailer door was opened and Traveler was released (Sept. 19, 2007). That photo is an example of what separates us amateurs from the pros – and it is part of what has me so excited to see the other photos of wild horses he has “captured” with his camera. Grey (Traveler) at sunset in the basin on Oct. 14. This was the first time since his release that I had seen him; he was with six other bachelors. He has been alternately with all of them, some of them and alone since that time. This is Molly, the muley bay released mare, with grey stallion Kreacher in the background. Their family also includes sorrel mare Roja. I think Roja is young, and I’m sure she’s pregnant. I’m unsure about Molly’s pregnancy status at this time. Harry Potter fans will recognize the name “Kreacher.” The day of this photo, Oct. 20, 2007, was the first time I saw this band, and I thought, “What an ugly creature.” Pretty easy to name him after that! Molly doesn’t have the best conformation herself, but she has a sweet face. That’s Cinch in the lead (you can see the belt-like marking on his side that gave him his name), followed by Corazon and Twister. 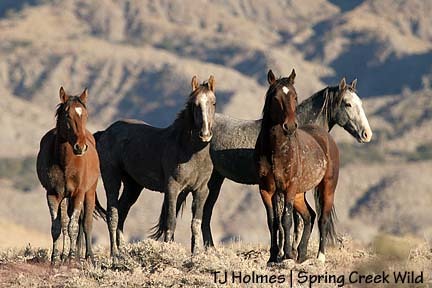 I had seen these horses – and figured out it was two bachelor stallions with an orphan – earlier in the day (also Oct. 20). I took this photo from my Jeep out on the county road along the edge of the herd area. I couldn’t believe my luck to see them twice. This pic is pretty heavily cropped. The next time I saw Twister, he was with his current family: Seven, Houdini and Two Boots. This is one of my favorite pix from all the years I’ve been visiting the horses. These are four of the “Bachelor 7,” from left, Aspen (note his upside-down Aspen-leaf star), Hook (see the “hook” of his snip between his nostrils), Duke (the leader) and Chrome (you can see his big blaze here but not his four stockings). Taken near sunset Nov. 4, 2007. Another of my favorite pix. That’s Seven at left, just a few minutes after the photo right above this was taken, chasing the bachelor boys away from his mare, Houdini, and their foals, Two Boots and Twister. He looks very determined, doesn’t he? This is a very promising young stallion, I think. There are two young mares in Steeldust’s band, Piedra and Rosa, and I’m unsure if they’re his daughters or if he picked them up after they were kicked out of their sires’ bands. They don’t look pregnant, so I’ve guessed their ages at 3. If they ARE his daughters, he’ll likely kick them out this spring. If that happens, where will they end up? Will one of those bachelor boys get lucky, or might Seven add them to his family?